Simplify a multi body, multi feature model into a single body, single feature model. In this Blog we will show you how to address this and point out some new functionality in Solid Edge ST5 that really aides us in doing so. Here is our PathFinder after we have opened the file into Solid Edge part. 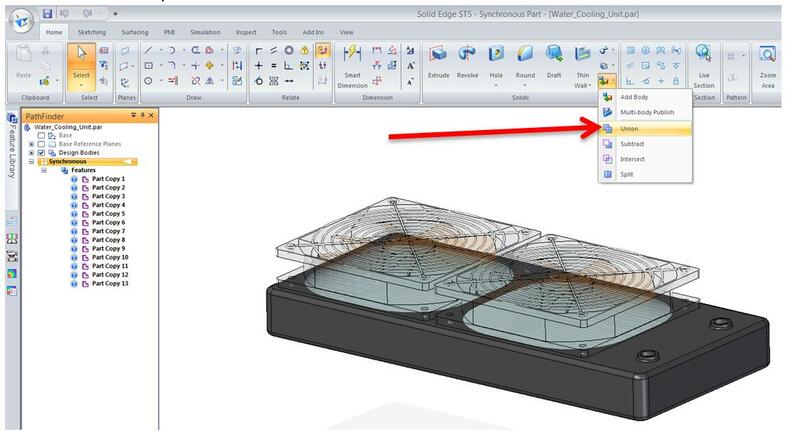 In Solid Edge ST5 we introduced new functionality to handle multi body designs. Since the imported file was most likley an assembly, opened into a part template, we handle each body separatly within the part file. Our intent is to combine all of these bodies and have only one feature. To do this we will use the Unite command. After selecting the Unite command, fence select the entire model and then accept the selection by selecting the green check mark. With the addition of multi body design in ST5 we now handle non-manifold conditions. The benefits of this are evident. We want to unite all of these features but because of some unknow non-manifold we have not been able to do so. In ST5 we can handle non-manifold conditions and are also given some indication where the model is in the non-manifold condition. In ST5 when a Unite command is run and encounters a non-manifild condition, instead of failing we will be presented multiple design bodies one body being the bulk of the union and the others being the non-manifold features that could not be united. Once the Union dialog displays, drag it off the active view before dismissing it, and make note of any areas of the model that are being highlighted (in this case it appears to be the ends of the fan shafts). Edit the model as needed to rid the non-manifold condition. 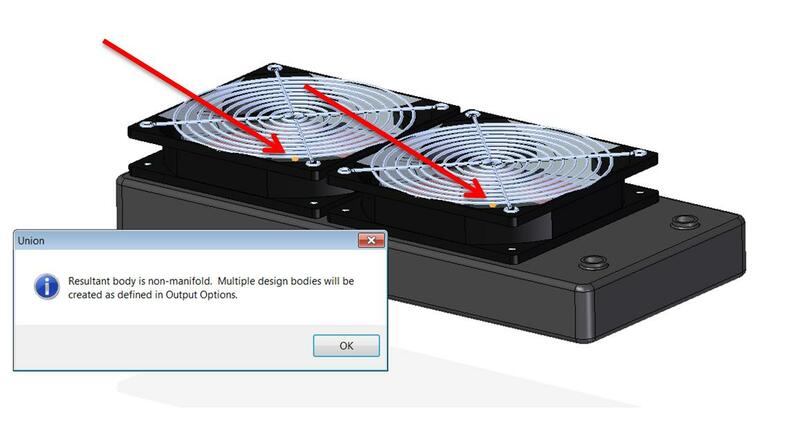 Solid Edge Help defines non-manifold as “Two or more faces on one body that are connected at a theoretical point or line and form a zero thickness edge.” Fix the model by adding or removing material from this theoretical thickness area. In this example since the fan shaft appears to be the issue and we don’t need the shaft for anything critical in our application, let’s simply cut the shaft length down to absolve the non-manifold condition. 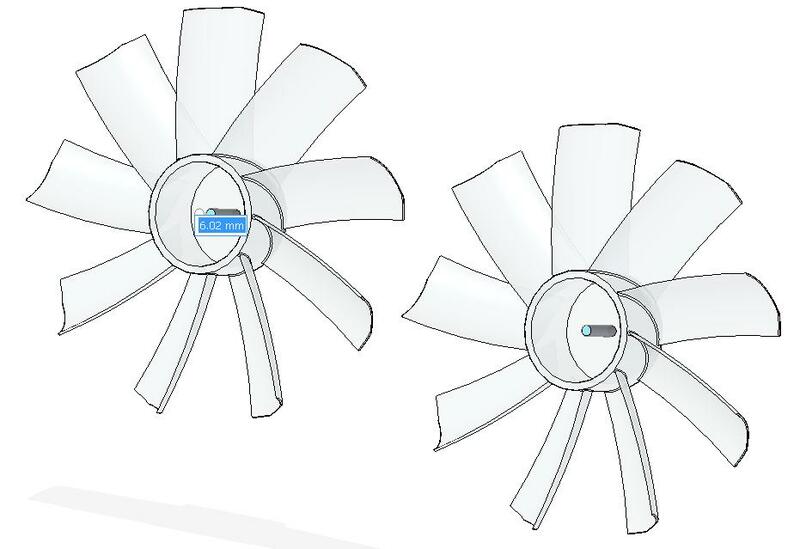 Note that Synchronous edits and live rules are honored across multiple Design Bodies, so editing one fan shaft will edit them both with the co-planar live rule being honored. Now let’s look at the PathFinder again. We previously had 13 Design Bodies – now we have unioned this down to 3. We can see that DesignBody_1 contains all features except for PartCopy _5 & _6, representing the fans we just fixed. Since we have already addressed what we believe to be the non-manifold condition, let’s run the Union command again. Re-select Union, fence select the entire model and accept by selecting the green check mark. The resulting PathFinder confirms that we have unioned all bodies into a single body. 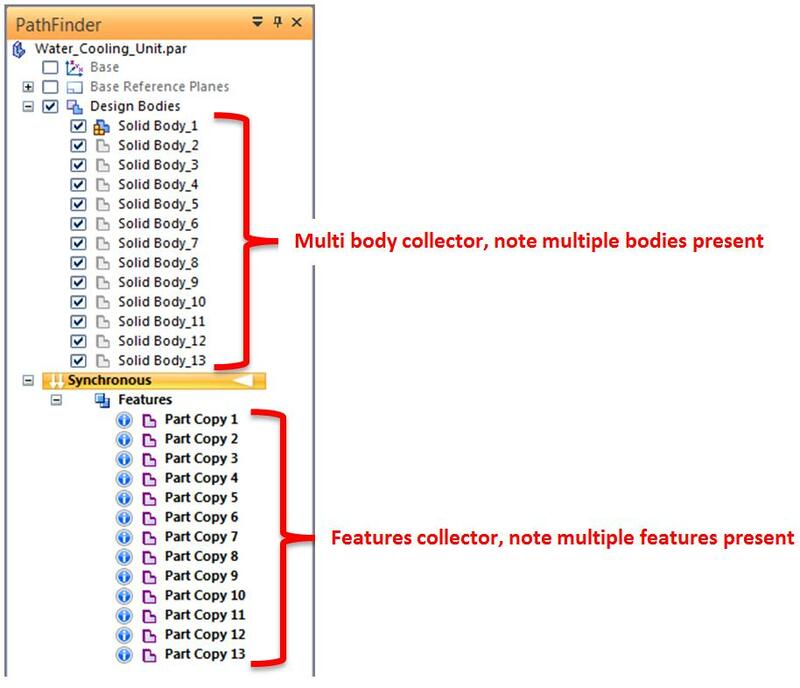 Note that when only one body is present in our part file, no bodies collector will be present. 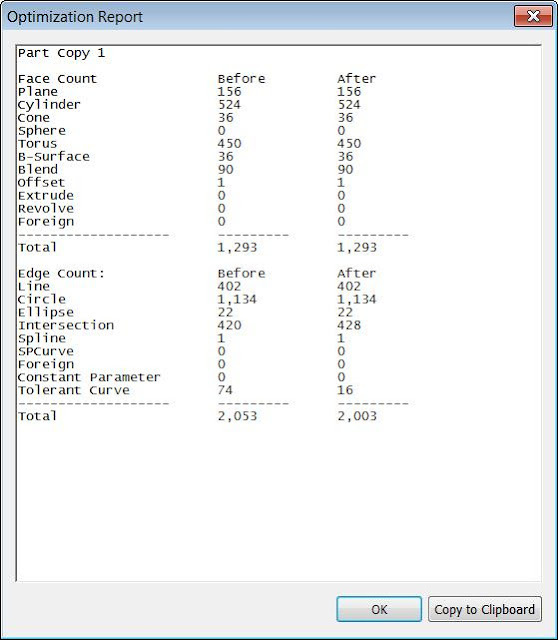 To combine all of the Part Copy features of this model into a single feature, we will translate the file out as a Parasolid and re-open it into Solid Edge. This will create a single body, single part copy model. 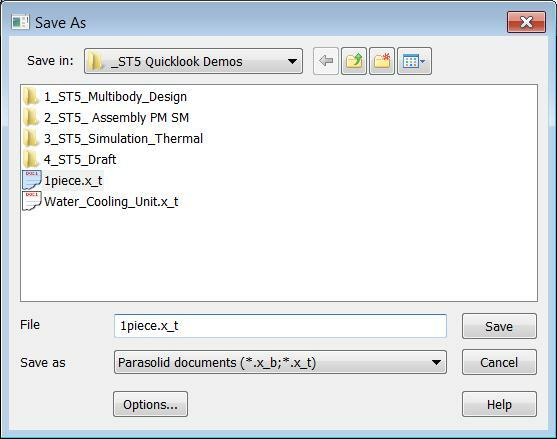 ST5 offers new functionality to optimize the geometry. 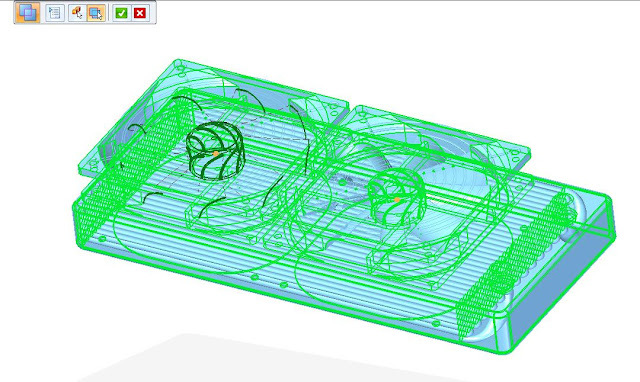 Solid Edge Help tells us that optimize “Analyzes imported data and improves the quality and precision of the model geometry. The improvements are made by simplifying B-spline definition, healing edges, and identifying blend-like faces”. If you look back to the beginning of this example all features contain this icon and could have been optimized. Since the goal was to union all features, I chose to ignore the information and continue with our process. At this time, however, let’s optimize the model. From the Inspect tab run Optimize. Fence select the entire model and click finish. 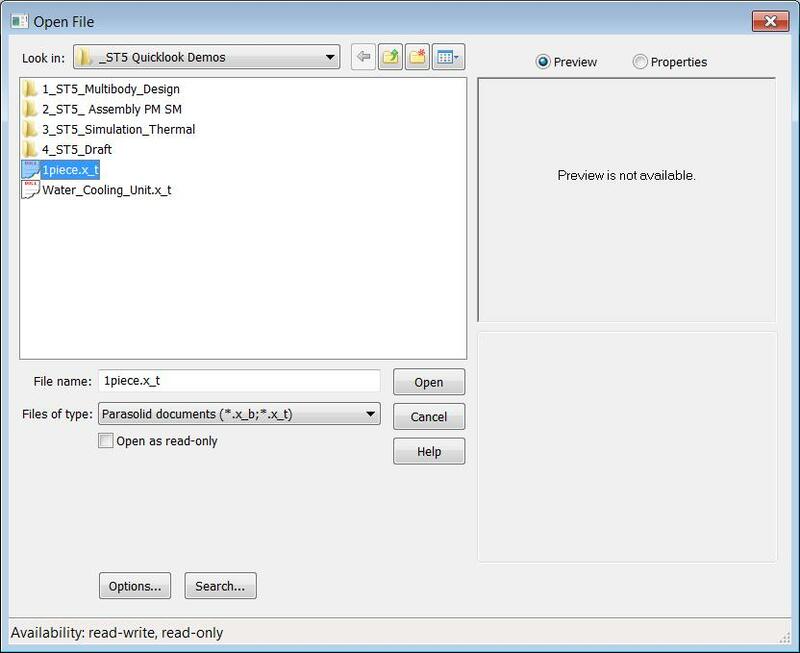 Upon completion an Optimization report will be shown. In this example we see that multiple intersections and tolerant curves were optimized. The result removes the information icon from the feature in the PathFinder. 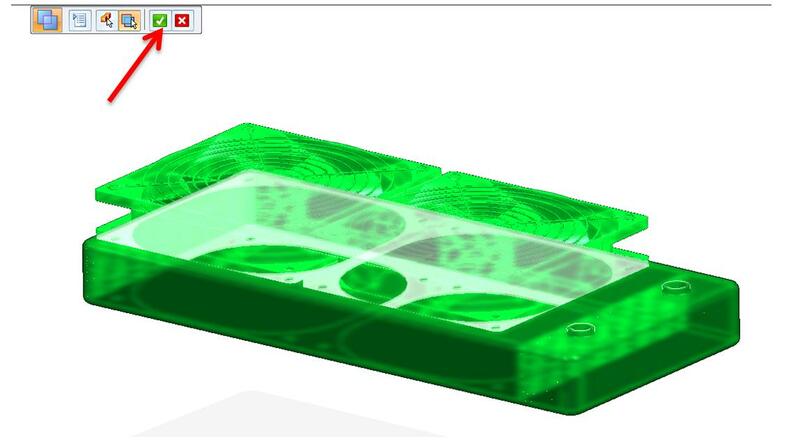 A final save as Solid Edge .par file finalizes our optimized, single body, single feature model.